What would you do if you didn't know how to make a cake? One boy decides that he will steal them! Oh, he doesn't just steal small cakes, but the big celebration cakes. The Ace of Cakes cakes that he finds on window sills and under cake domes in the homes of his neighbors. 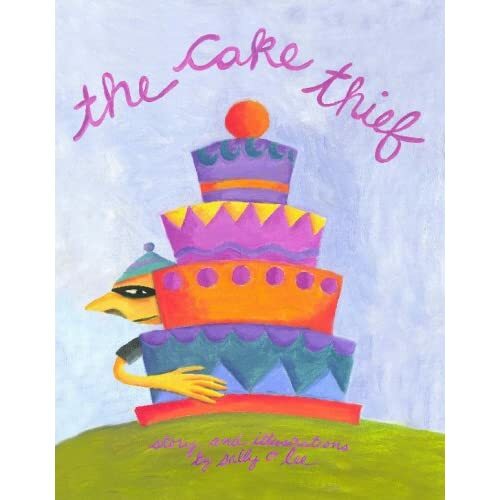 This funny tale of cake thievery did amuse my pre-school aged daughter. It wasn't quite clear to her mama why he decided to steal cakes, but it was still author Sally E. Lee is also the illustrator and I really loved her illustrations. Overall, this was a cute book and one that certainly kept my squirmy daughter slightly less squirmy - which is certainly a good thing!